A Virtual Backgrounds System, can help put new excitement back into School Photography, which as we know, can be quite difficult, yet still very profitable if done properly. One of the biggest problems in obtaining a school contract is being able to show diversity in backgrounds and pricing. Pricing, cannot have a lot of difference without resistance, but diversity in backgrounds can be very beneficial. The day that everyone is satisfied with the same background look from year to year is over. 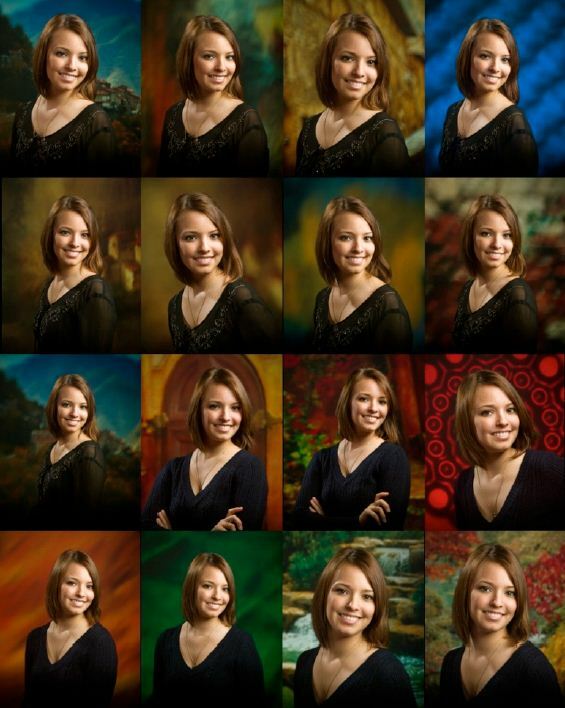 Some schools are wanting to do outdoor images, but if it rains, this becomes a nightmare of almost epic proportions. Yet others want a color scheme or something different in the background that will signify their school. In other words, they are wanting customization of the backgrounds to fit whatever they need at the time. This can be very costly for photographers when purchasing and storing backgrounds…..unless they choose to use a Virtual Background System. Of course this system has it’s initial expenses, but the versatility of this system is phenomenal. With this system, customization and changing of backgrounds is almost effortless and incredibly fast. Whether it be a colored background, special symbol, or even outdoor scenes as backgrounds, the front projection Virtual Backgrounds System is by far the most cost effect background system in the world. Unlike Green Screen, after its’ initial cost…. there is no more cost added to the production of the images for each school. Also unlike Green Screen, there is no post production work needed. There is no special software, computers, limitations of clothing, jaggy edges or green bias on the skin. In simple terms…. when you capture the image, you are done with that image. Each time you look through the viewfinder of your camera, you are seeing what the finished image will look like. This system helps define the term WYSIWYG, ….What You See Is What You Get. The VB system can produce some of the most creative and magical images you have ever seen. One of the most profitable aspects of VB is not having the “continuous cost of green screen post production”. Rick Harding shows his process for setting up and photographing volume school photography with a Virtual Background Optical Slide system.